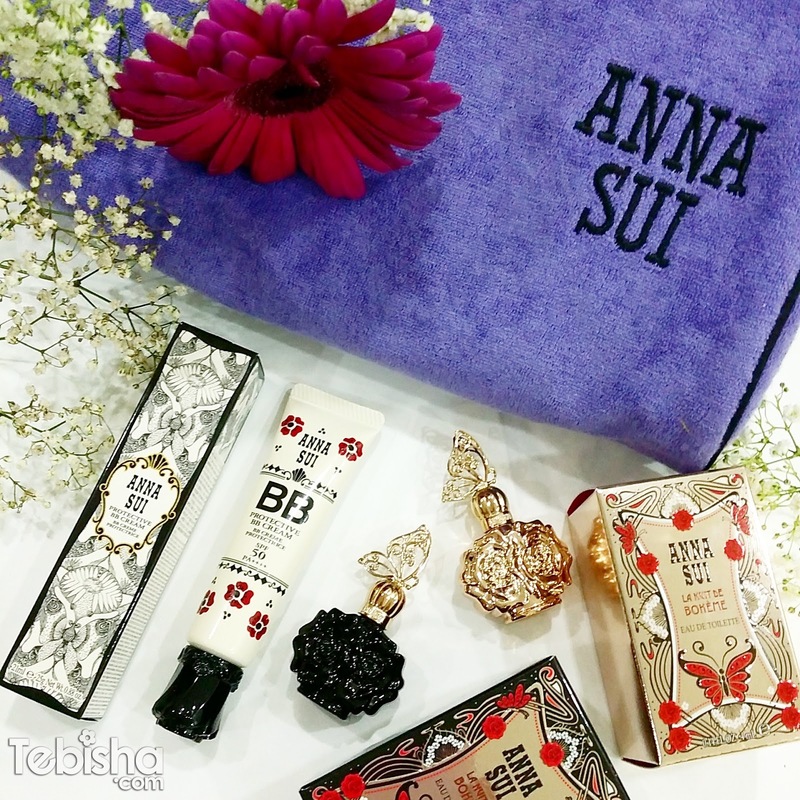 This Autumn, Anna Sui has released 3 products under the Autumn Collection Theme MAGIC TRICK. The 3 products are Illuminating BB Cream, Protective BB Cream and Loose Face Powder N.
Thanks Luxasia for having us at the launch and makeup demo event last month. We get to try out their latest Autumn Collections and witness the makeup demo using Anna Sui makeup range. Anna Sui never fail to produce lovely product packaging, remembered their Star Lipstick launched previously, and this Fall Collection, the Loose Face Powder N casing is stunning! Anna Sui Loose Face Powder N is now added to my makeup collections wishlist, I have to own one! Anna Sui Loose Face Powder N, the face powder uses the trick of light that leave the skin poreless and flawless. Non-powdery and blends into the skin. 3 shades available: 200 Purple Lucent (Sliver Pearl), 700 Light Beige and 701 Natural Beige. I’ve gotten Anna Sui Protective BB Cream in my press kit, very excited to try it out. At the event, I did the swatches on my hand and find the BB Cream is a bit too heavy and creamy for my combination skin. But I do not want to make my judgement by the swatches so I decided to try it out on my face first before giving my reviews. Reviews: After tried out the Protective BB Cream, I being to love this high function BB cream. The coverage is superb, no concealer is needed after application. It covers my dark circles, acne scars and dark spots well! It’s not just a foundation, it also works as a sunblock, primer, foundation and skincare! Easy to apply and blends well on my skin, although its slightly creamy at first, but after blending it became lightweight and no sticky feeling. 2 shades available, 01 Light Beige and 02 Medium Beige. I’m using 01 Light Beige. Both Illuminating BB Cream, Protective BB Cream is retailing at S$39 each. Also introducing Anna Sui new fragrance, Romnatica. Classified as a Sparkling Floral, it is at once joyous and sensuous, lively and exciting. The top note opens with a floaty feeling of Calabria Bergamot, Mandarin Essence, Sparkling Pomegranate, and Watery Quince. It is giddy, it is glorious, it is like falling in love all over again. Soon to be followed by Rose de Mai, Osmanthus Absolute, Jasmine Petals, and Orange Blossom, the romance builds to a crescendo, awakening a deeper sensuality. Water Lily and Peony Blossom add a touch of whimsy and freshness to the heart. And then it settles with White Ceylon Cedarwood, Sheer Amber, Indonesian Sandalwood, and Creamy Musk. Once again, thanks Anna Sui and Luxasia for the event invitation and exquisite press kits.